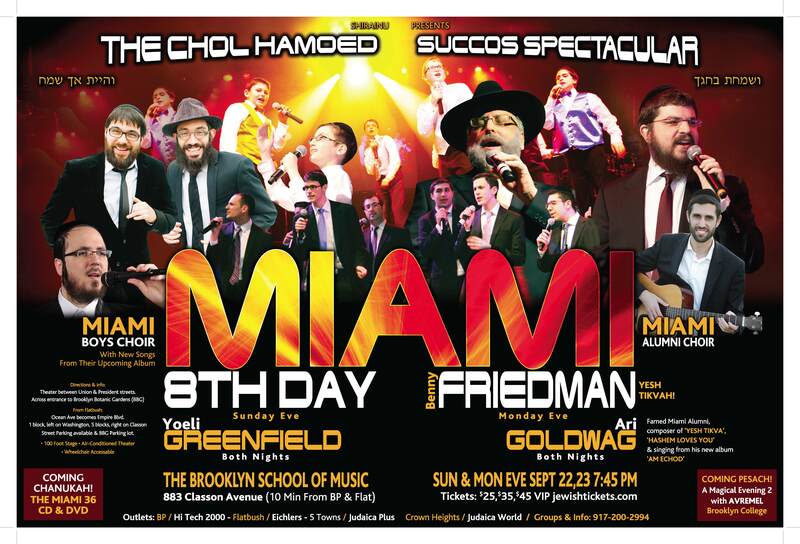 THE CHOL HAMOED SUCCOS SPECTACULAR! Coming to the Brooklyn School of Music, are 2 amazing current star packed shows, which will cater to all Jewish music fans! Starring YERACHMIEL BEGUN & MIAMI, with full appearances by both full choirs. The one & only MIAMI BOYS CHOIR, and the newly introduced MIAMI ALUMNI CHOIR, who made a smashing debut at the recent Pesach ‘MIAMI 36’ show. Their performances together & on their own were nothing short of mesmerizing. Sunday evening will feature 8TH DAY, the highly acclaimed wildly popular group that has taken the Jewish music world by storm. Much more than just the hit ‘Yalili’, they personify fun and sophistication together in a fantastic blend. The Mon. eve. show will feature BENNY FRIEDMAN, one of the hottest singers today. Coming off his ‘YESH TIKVAH’ success, Benny has been in constant demand for weddings and concert worldwide. His stage energy and authenticity is catching, as the audience gets involved and inspired. Both shows will feature the next 2 performers. The amazing Yoeli Greenfield, new Chassidic superstar, considered ‘The Voice’. Yoeli enthralls audiences with his vocal range and beauty; and after making a debut concert performance this past Pesach on ‘A Magical Evening with Avraham Fried’, he returns for an encore. Famed Miami Alumni & star soloist Ari Goldwag, is coming in from Eretz Yisroel & appearing in his first solo performance ever in NY. Ari has composed and sang on many albums, including his latest release ‘Am Echod’, coming to stores Sept 1. Ari composed such hits as ‘Yesh Tikvah’, ‘Hashem Loves You’, ‘Ku Rebone’, and is the producer of the Sheves Achim albums. The show will feature some amazing duets between the performers. The Orchestra will be the Shirainu orchestra with Gal Gershovsky. The 100 foot stage, air-conditioned Brooklyn School of Music Theater, is located right off the circle of Grand Army Plaza at 883 Classon ave. 10 minutes from Boro Park & Flatbush, with plenty of parking available. Tickets are available at jewishtickets.com. Prices are $25, $35, $45, & VIP. Outlets are: Boro Park – Hi tech 2000, Flatbush – Eichlers, 5 Towns – Judaica Plus, Crown Heights – Judaica world. Groups can call: 917 200 2994. Don’t be left out – be a part of this Phenomenal All- Star Chol Hamoed Event!